There are a few different garage opener makes and models on the market today. The two main companies are Chamberlain Group, manufacturer of the LiftMaster brand and The Overhead Door Company, owner of The Genie Company. It’s estimated that LiftMaster and Genie brands are in 90 percent of the some 50 million garages in the United States. So which brand is better, and how do you choose? In order to compare the two brands you must consider certain standard factors of each: safety, security, warranty, price, reliability and features. Safety: Genie has a Safe-T-Beam®System built into the garage door opener to prevent the door from closing when an obstruction is in the door’s path. Similarly, LiftMaster has The Protector System®, which is also an infared safety reversing system that protects an obstruction from the path of a closing door. LiftMaster also has automatic safety reverse/automatic door stop, which provides a second and third from type of protection from a moving garage door. It reverses automatically if obstruction is encountered when being closed or being opened. The door can also be stopped or locked at any height for ventilation purposes. Security: Genie has Intellicode® rolling code technology which automatically changes your access code every time you push the remote control button. This stops an unauthorized person from stealing the code to your garage door and gaining entry to your home. LiftMaster has a similar Patented Security+® rolling code technology, which offers the exact same security. Plus, LiftMaster has PosiLock®, which electronically secures a closed door and monitors against the door ever being manually forced opened. Also, LiftMaster has temporary password options for the Keyless Entry System so you can provide a temporary password for family, friends or service people without revealing your private password. The password can be programmed for limited number of activation and time. 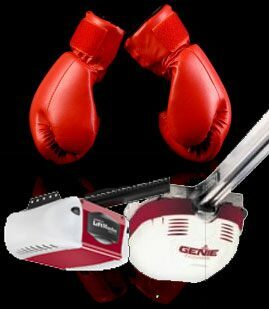 Warranty/Price: Both Genie and LiftMaster openers have similar warranties and prices. Many openers manufactured by both companies offer lifetime warranties on motors and 1-5 years on parts. The prices for both brands are about the same for similar models of each. Reliability: Both Genie and LiftMaster are known for their high quality and reliability. However, LiftMaster models are more commonly used, recommended and regarded as the better choice for reliability. When it comes to customer satisfaction, and the better opener for durability, speed, noise and reliability, most garage door companies choose LiftMaster brand openers. Consumer Reports has listed LiftMaster openers higher than Genie brands for the past five years. Features: As for standard features, both Genie and LiftMaster brands offer similar types of remote controls and wall control panels. Genie and LiftMaster carry chain, belt and screw drives. However, the added features that LiftMaster offer outweigh those of Genie. LiftMaster offers models that have an EverCharge Battery Backup System. This system is designed to operate your garage door opener for up to 40 cycles when the power is off. So when the power is out, you will be able to safely get in and out of your garage. Also, LiftMaster offers their Smart Control Panel that displays the time and temperature. Plus, a motion sensor in the control panel has a hands-free, 200-watt light that shuts off automatically after you leave the garage. In addition, LiftMaster offers a completely different kind of opener – the Residential Jackshaft Opener. Instead of being mounted on the ceiling, this opener is mounted to the wall beside the garage door, so that your ceiling space is free for maximum storage. It’s an ideal opener if you have an oversized door or high ceilings, because the door opens straight up, instead of along your ceiling. So, LiftMaster or Genie? LiftMaster offers more conveniences, features and is proven to be a more reliable opener. With similar warranties and prices as Genie, a LiftMaster brand opener is the better buy. « The First Solar Panel Garage Door?